Access your computers from wherever you are! 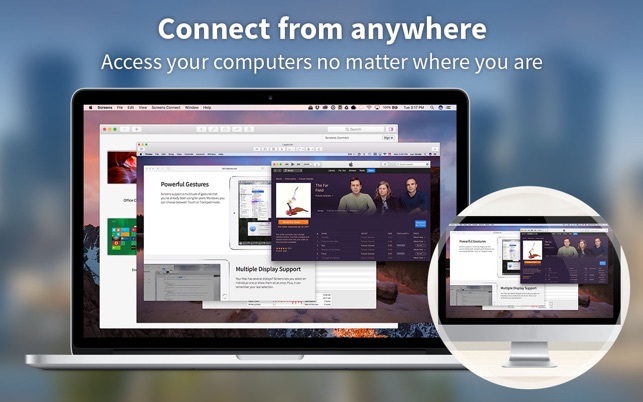 Screens lets you connect back to your Mac, Windows, Linux PC or Raspberry Pi and control it from the comfort of your living room, the corner coffee shop or anywhere in the world. 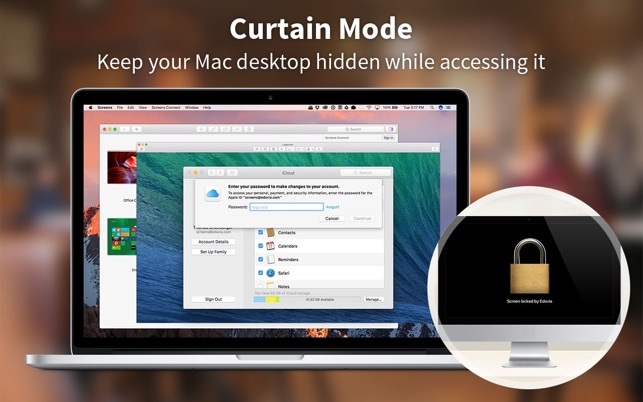 Keep your Mac desktop hidden while accessing it. 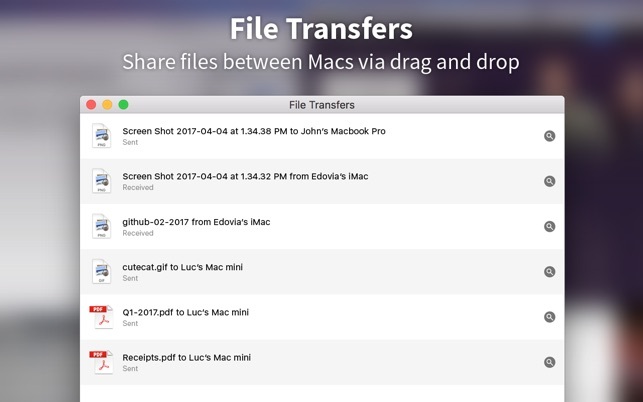 Share files between Macs via drag and drop. Screens can connect back to your computer through a secured connection. 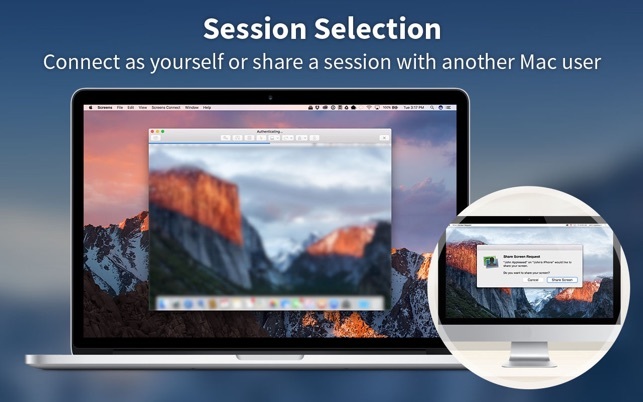 Connect as yourself or share a session with another Mac user. Your Mac has several displays? Screens lets you select an individual one or show them all at once. 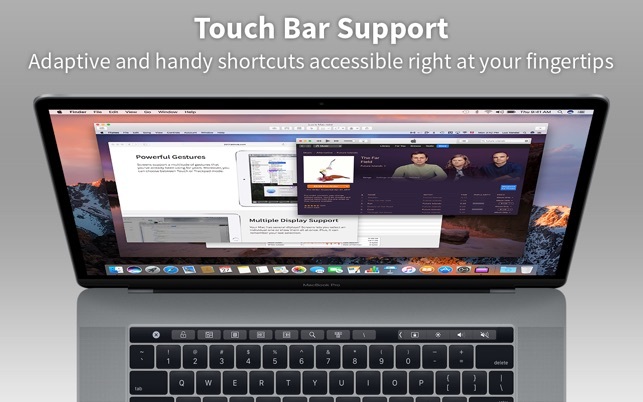 Adaptive and handy shortcuts accessible right at your fingertips. Gather your saved screens as groups and keep everything in order. • Windows, Linux PCs and Raspberry Pi can only send or receive text and URLs. Pricey, but it does exactly what it’s supposed to. The $30 price tag was a tough bullet to bite considering there is Screen Sharing built into the OS for free and Microsoft Remote Desktop in the store for free. But, Screen Sharing has been incredibly flakey since the High Sierra update. It won’t resize my host window to fit in the constrains of the screen and makes me mouse to scroll around the window. Very frustrating. Screens 4 worked perfect on my iPad, so I felt comfortable spending the money here. I wasn’t disappointed. Screens 4 combines functionality of both Screen Sharing and Microsoft Remote Desktop and does it remarkably well. If you’re on the fence, there is a Trial version on the Developer’s website. If you want to connect to your computers at home from a remote location, it will require a little bit of knowledge in port forwarding and setting up static IPs. Learn to log into your router and find a guide to set up mapping. It appears to be much more complicated than it really is. 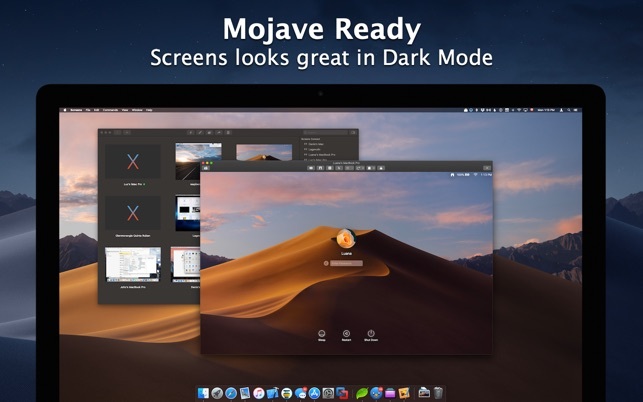 We all found out in August 2018 that the upcoming macOS Mojave was going to drop support for Back to My Mac (BTMM). That was a disappointment as it was a feature I use regularly to connect to a Mac Mini server at home. Though unrealiable over non-local connections, BTMM was useful. After some online research and reading of reviews, I stumbled upon Screen and decided to give it a try. Wow! It does exactly what BTMM did, but connects reliable over both the local network and the internet, from anywhere, every time! I couldn’t be happier. Setup was easy, and the included help was easy to understand though not necessary. I highly recomment Screens 4 for anyone looking to maintain BTMM functionality after the upgrade to Mojave. I was hoping to use Screens to manage a Linux machine running the x11vnc server, and a Windows VM (running on that Linux machine) using VMware Workstation Pro’s built-in VNC server. Unfortunately, it has shortcomings that make it impractical to use with both of those kinds of VNC servers: First, scrolling (with two fingers on my MacBook’s trackpad) is ludicrously fast, to the point of being unusable. I move my fingers half an inch upward and a browser on the remote machine scrolls by several entire screenfuls. Other VNC clients (I’ve tried TigerVNC and RealVNC) don’t have that problem. Second, the VMware VNC server supports adaptive compression and it works with TigerVNC, but not with Screens, so scrolling and other screen updates are sluggish. The UI is nice and Screens is probably great for managing one Mac from another, but its compatibility with non-Mac VNC servers is apparently not so great.